I can’t believe it’s only been 1 week since I started classes here. Over the last 5 days, I have felt like I am drinking from a firehose while simultaneously making 90 new best friends. I spent some time reflecting with friends this week, one of whom made me promise that I wouldn’t “keep it vague.” So here it is, week 1 insights in a nutshell. Part of the reason I want to be sure to keep sharing insights about my experience here is because I benefitted greatly from the blogs of people who have done this before me (h/t @ellenchisa) when I was deciding whether or not to go to business school. The start of anything can shake you to your core, and this experience puts you in a blender and burns the candle at both ends. It’s great, but profoundly exhausting. We’re just getting started. With no basis for comparison, Harvard feels like I am running a marathon at a sprint’s pace. The week started with Section reveal at 7am Monday morning – when you find out who you’ll be spending the whole year learning, debating and making friends with. It’s also the crew you do reunions with and probably the better half of your business partners/friends/colleagues for the rest of your life. I have a great, lively, brilliant group of section mates who make the day go by in a breeze. Go Section F! 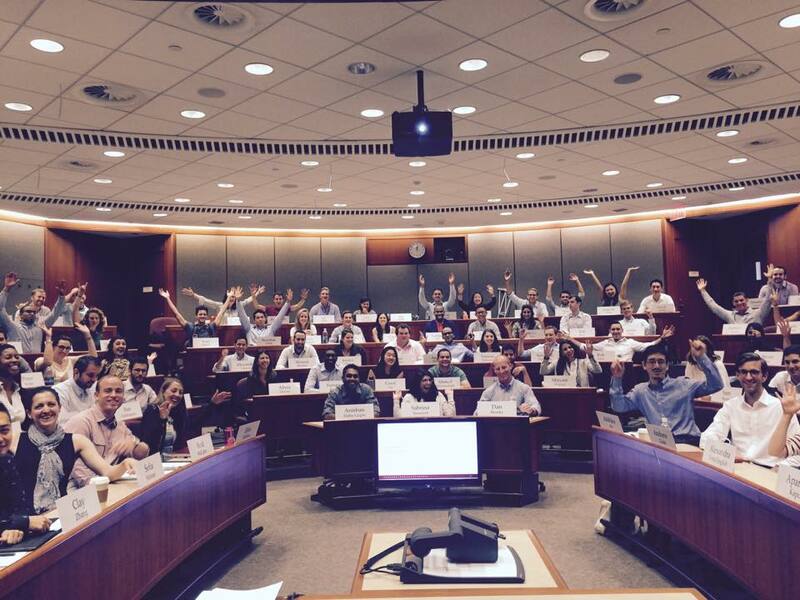 HBS teaches by using the case method: practical stories with demonstrable applications of business principles, and nuanced lessons that can be debated in every possible way. We spent 2 days learning about the case method by doing none other than 2 cases. The days were peppered with social activities, alumni panels and an opportunity to meet 2nd year students (ECs) who answered questions. The crux of the week came at the end, when we had our first 2 days of classes each of which had 3 cases. The courses we are required to take in the first semester spread from Finance (FIN1) and Accounting (FRC) to Leadership (LEAD), Technology and Operations (TOM) and Marketing (MKT). There’s no such thing as isolating one business problem: every case could be examined from each of these 5 lenses, and you would unearth something that sways you in a different direction each time. Practical learning is much more enjoyable than textbook learning: I’ve never taken accounting, but it’s a lot more enjoyable to contextualize a problem than to create sample balance sheets. Everyone is social all the time: I am giddy every day by the idea of getting to know such a brilliant cohort of people. Taking time to really get to learn about them seems overwhelming at the start – there are a lot of people I want to know and many group events that connect us. People are warm, friendly and gregarious in a way I’ve never seen in a professional environment. I am looking forward to being in a routine that allows me to do this in a more in-depth way. Listen: this has always been a weakness for me. I started by always having my hand raised in class, but I’m learning that it’s much more valuable to listen to the conversation around you and to interject only when you have something truly meaningful to say. People in the room are much smarter than I am, and often bring to light ideas that had never crossed my mind. Be discerning about hand raising – and only speak once per class. Collaboration is highly encouraged: unlike in grade school where it was important to do your own work, we excel when we work together. Discussion groups are a valuable forum for this – leverage the experience of your peers and let them do the same with you. The reason to take several years in between college and business school is to be able to give genuine perspective from personal experience on certain topics. Figure out what you want to be known for, and move fast: Everything moves very quickly here. People are constantly posting ideas, gatherings, questions, etc on social media. In observing this, it’s helping me figure out what kind of role I can play and how I can add value to the group. Introspection is critical to growth: Harvard asked us to submit personal portraits about what we’d like to get out of these 2 years. The application process is a way to step back and reflect, and the act of taking yourself out of the work force most likely forced us all to think about these things before we acted. Nonetheless, this task was extremely challenging but very rewarding: I now have a stronger sense of what motivates me, what my values are and how to think about being introspective and reevaluate during this time. Bring your own lunch: the Spangler cafeteria is insane from 12:10 to 1:25. Be punctual – not to be taken lightly: This is seriously critical and indicative of better business behavior. On the contrary, the business formal thing isn’t really all that. Business school is genuinely fun: it’s a time to step back and reflect, and also to enjoy meeting new people and reconnect with old friends. Smile!